It has been 17 years and 292 days since the city’s pledge to build the West Branch Library. On October 8, 2015 Glendale released its analysis of the expenses incurred in hosting the Super Bowl. Here is the link to the full report: SuperBowlXLIXPostEventAnalysisFinal2015_10_08 . I don’t know why this report is not on the city’s website. It should be available to every Glendale resident. The report is comprehensive and offers, “The purpose of this report is to provide a comprehensive overview of the city’s obligations and how they were met, a summary of the ancillary events and activities that took place, an analysis of specific city services provided, an assessment of stakeholder impacts, and a comprehensive financial analysis (page 2, executive summary).” I do take issue with some elements of Glendale’s final report, namely, cost avoidance and the lack of tracking employee time. As I have suggested innumerable times, the only way hosting the Super Bowl works for Glendale is if a reimbursement mechanism is created by the State Legislature or the Host Committee. Whether the loss is a half million dollars or two million dollars, it is not a cost the taxpayers of Glendale should bear to enrich the state or other Valley communities. Glendale noted, “Other communities around the country that host Super Bowl have established a state-level funding mechanism to cover costs to local communities, or in some cases, Host Committees reimburse cities for associated costs. As an example, the city of Santa Clara, California (host of the upcoming 2016 Super Bowl) entered into an agreement with their stadium and Host Committee wherein the Host Committee is responsible for reimbursing the city’s direct costs (actual costs incurred) for all planning and execution activities associated with providing governmental services inclusive of public safety, traffic management, planning, building inspection, and public right-of-way clean-up (page 2, executive summary).” Until such time as a reimbursement mechanism is created Glendale should not participate in hosting another Super Bowl. The report emphasizes the issue of cost avoidance. What is cost avoidance? According to the report, “At the onset of planning, staff was tasked with identifying service delivery alternatives or creative innovations that could be implemented to reduce costs or engage community partnerships in support of the city’s planning and execution efforts associated with Super Bowl XLIX. As a result of the combined efforts of the city’s planning team, Glendale realized cost avoidance of approximately $672,781…(Page 15).” Cost avoidance is only legitimate when it absorbs costs to provide necessary services to plan or execute the Super Bowl event. There were 2 items that could be classified as true cost avoidance: Light towers provided by the Department of Homeland Security at a cost of $12,000; and the city’s successful negotiation to eliminate a shuttle obligation at a cost of $200,000. These 2 items totaled $212,000. An item that should not be considered cost avoidance ($415,625) is Valley fire and police agencies contributing staff time at their own expense. It is generally understood and accepted by all that any host city (anywhere) is not capable of providing the total police and fire services required. Other agencies understand that they will provide staff time at no cost to the host city. This action occurs at all Super Bowls, not just here. Calling this item cost avoidance is no more than ginning up the cost avoidance numbers. Other items listed as cost avoidance such as the Visiting Public Safety Officials Program ($16,656) were not required or necessary to plan or execute the Super Bowl. True cost avoidance totaled $212,000, not the $672,781 touted by Glendale. I can see it now. When one of these people had to meet regarding the Super Bowl, they designated an associate to be in charge of their regular duties. Their responsibilities transferred to someone else who had to pick up the slack. These are valuable employees whose time was taken away from administering their departments and providing service to every Glendale resident. How much time was diverted from providing service to you, me, all of us? 1,000 hours, 2,000 hours? Glendale may consider it inconsequential to track their time but we, the taxpayers of Glendale, would like to know how many hours and the value of their time was diverted as a result of the Super Bowl. It is a true cost that must be accounted for. Add the cost of non-salaried employees (paid wages and benefits for a 40 hour work week) who were tasked with carrying out the plans of this committee. It constitutes a direct transference of service time belonging to Glendale residents and diverted to support the Super Bowl. Glendale’s rationale for its failure to track employee time and consequently the value of that time as a direct cost occurrence is, “In conclusion, the determination was made that the task of serving as the host city for the Super Bowl was a service being provided as a result of Council direction (Page 13).” On the face of it, that is one of the most illogical statements ever. Glendale goes on to say, “More importantly, requiring employees to track time would not be an effective or efficient use of scarce resources and there was no monetary gain that could be accomplished by doing so (Page 13).” Really? True, no monetary gain would be achieved but thousands of employee hours at real cost as well as service delivery avoidance to Glendale residents should be accounted for. It is a true cost to the taxpayers of Glendale that to date has remained hidden. Glendale goes on to say, “Setting aside cost avoidance, after accounting for Glendale’s direct costs and direct fee-based revenue, the result was a negative net financial impact of $578,965. It is important to note that this does not account for any costs associated with pre-planning activities (Page 2, executive summary).” If the costs of employee time were recognized in this report it is expected that the true cost, rather than the $578,965 acknowledged would double to over a million dollars. It is to be expected that Glendale would put as much positive spin on its hosting costs as possible and goes to great lengths to point out that Glendale does not have enough hotel rooms or venues to gain financially as well as offset it costs to host a Super Bowl. The overarching issue remains that Glendale experiences a financial loss in hosting the Super Bowl. Until that is remedied Glendale should not be in the Super Bowl hosting business. It has been 17 years and 147 days since the city’s pledge to build the West Branch Library. We all know about the billions the NFL (as a non-profit organization) made from the Super Bowl. It is estimated that the city lost somewhere between $1 and $1.6 million dollars. It turns out it was lucrative for some city employees working overtime for these major events. A total of 305 city employees were credentialed for the Super Bowl. They did not have assigned seats but that would not have prevented them from being in attendance. Many of them worked. The guys and girls on the line – 36 firefighters and 92 police officers – worked hard that day. Some credentialed employees in attendance if truth be told didn’t work at all but certainly were in attendance. 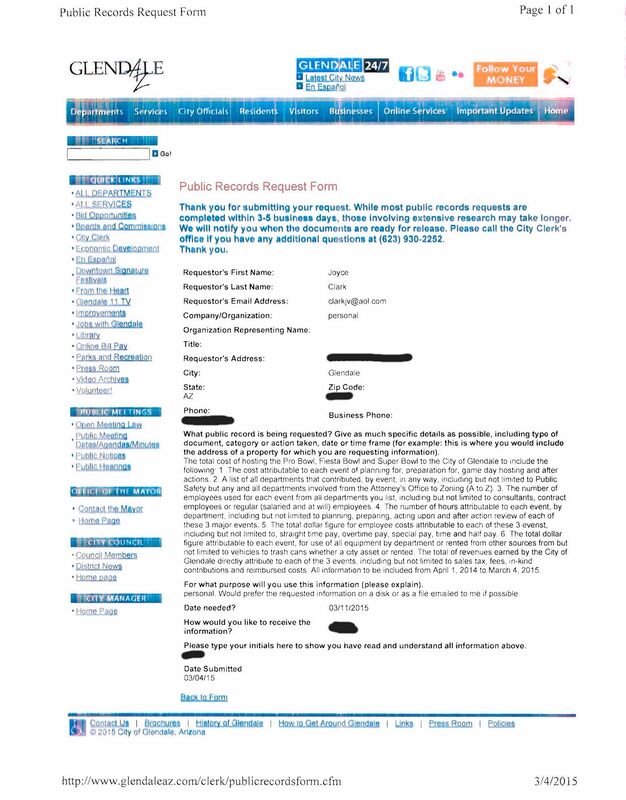 When asked under a Public Records Request to verify those employees who actually used their credentials this was the city response, “The city does not have any records to produce that would be responsive to this request. The credentials provided did require the user to scan in and out upon entering the hard perimeter of the stadium; however, the scanning equipment used did not belong to the city, nor was the city provided with any reports or other information about city employee scans.” How about that? The city doesn’t know but presumably the NFL does. Jean Moreno, Sam McAllen, Joe Hengemuehler and Julie Watters worked within both groups. These 2 groups were made up of 34 employees some of whom are high salaried employees. What remains troubling is that no accounting of their time and talent is tracked by the city yet they are expenses that the city incurred to host the Super Bowl. Whatever figure the city claims as its cost to host the Super Bowl is bogus as long as all costs are not tracked. Employee time and wages are one component of the cost. What about equipment used? Police and fire vehicles, sanitation trucks, transportation equipment, etc. the city used? What about O&M costs for these vehicles? What about other equipment or personnel I wasn’t wise enough to ask for in attributing costs? Although my Public Record Requests were as specific and detailed as I could make them there were sure to be items I never thought of including. As we all know if you don’t specifically ask, you won’t get it. The city is not going to volunteer to give up information. There you have it. Based on the information provided by the city I did my best to calculate expenses and revenues for hosting the Super Bowl. After all is said and done, Interim Assistant City Manager Tom Duensing’s figure of $2.2 million is incorrect. Add another million to two million dollars and you would be in the ball park. Perhaps the city will take note and if there should ever be another Super Bowl in Glendale city administrators will make every effort to track ALL costs not just the most visible – Public Safety. The city loses money owning the spring training ball park and the arena. Should it consciously continue to lose money hosting the Super Bowl and other major events? Perhaps it’s time to revisit any and all contracts associated with these major events as a means of city loss prevention. We love hosting them but the taxpayers of Glendale should not have to pay for them. It is incumbent upon the city to insure that all event promoters pay their fair share to alleviate the burden of loss the city continues to experience. By the way, the city in its city council meeting of May 26, 2015 refunded $3 million dollars to AZSTA (Arizona Sports and Tourism Authority) in sales tax. That sales tax would have gone a long way to covering the loss sustained by the city. What’s wrong with this picture? The Recall Councilman Gary Sherwood finally has its website up and running. Here is the link: http://www.stopsherwood.com .If you live in the Sahuaro district please share this site with your friends and neighbors. Below you will note an upcoming meeting on Becker billboards. Sherwood has been an ardent advocate for Becker billboards and that issue is just one of the reasons for his recall. On Tuesday, March 17, 2015 at 9:30 AM at Glendale City Hall in the Council Chambers city council will hold a workshop meeting. Item #1 on its agenda is to receive the recommendations of the three citizen commissions. There is no opportunity for public comment. City Council does not vote at a workshop meeting. They discuss an issue and present their positions. A consensus if formed and further direction is given to staff by council. There are only 3 possible directions that can be given by council tomorrow: rejection of the proposal to sell the Foothills library building and its relocation to the Foothills Recreation & Aquatic Center; tabling the item for further information and discussion; or direction to move forward with the proposal. A neighborhood meeting hosted by Mark Becker of Becker Billboards is scheduled for this coming Wednesday, March 18, 2015 at the Arrowhead Elementary School at 6:00 PM. He is again seeking city approval to place digital and static billboards at the Loop 101 and Bell Road. Glendale planning staff will be in attendance to listen and take notes. The cost attributable to each event of planning for, preparation for, game day hosting and after actions. A list of all departments that contributed, by event, in any way, including but not limited to Public Safety but any and all departments involved from the Attorney’s Office to Zoning (A to Z). The number of employees used for each event from all departments you list, including but not limited to consultants, contract employees or regular (salaried and at will) employees. The number of hours attributable to each event, by department, including but not limited to planning, preparing, acting upon and after action review of these 3 major events. The total dollar figure for employee costs attributable to each event, including but not limited to, straight time pay, overtime pay, special pay, time and half pay. List of all employees by job title and department, dollar amount for each of those employees who received overtime pay, special pay, assignment pay, time and a half pay, bonuses, Police & Fire to include sworn and non-sworn administrative staff from those departments. Separate list for each of those three events. The total dollar figure attributable to each event, for use of all equipment by department from but not limited to vehicles to trash cans whether a city asset or rented. The total of revenues earned by the City of Glendale directly attribute to each of the 3 events, including but not limited to sales tax, fees, in-kind contributions and reimbursed costs. Tom Duensing, Glendale’s Finance Director, has publicly stated that the cost of the Super Bowl was about $2 million dollars. I believe when all of the information and data I requested is researched and made available to me, the cost will be way over the $2 million dollar mark. You will note I also requested the city costs associated with the Fiesta Bowl and Pro Bowl. Those are additional real dollars and real costs borne by the city. I suspect the numbers will surprise everyone. I asked for an extensive amount of data and do not expect the information to be supplied in a week. I do expect it within a reasonable time period — a month. After all, Mr. Duensing is already claiming a number but I don’t think he has included all of the hidden costs. I will advise readers of the date that my Public Records Request is fulfilled. This is the kind of hard data that should have been provided to every councilmember and the public. I hope that the results of my request will be shared with them and with the public-at-large. It’s our tax dollars and we surely have a right to know. On January 29, 2015, just days before the Super Bowl,Glendale’s Mayor Jerry Weiers got his 2 tickets to Sunday’s game. Weiers had said publicly that to see a Super Bowl played in his hometown,Glendale, was on his bucket list. Mitchell Modell, CEO of Modell’s Sporting Goods, a chain located in the Northeast, bought Mayor Weiers the 2 tickets from the NFL. Weiers received them today when he attended a Friar’s Roast of Terry Bradshaw at the Arizona Biltmore. Correction: Weiers made clear that the face value of the Super Bowl tickets would be matched by a personal donation to the Shriners. The Roast attended by Mayor Weiers did not require tickets as he made a brief appearance to accept the Super Bowl tickets and then left for other committments. Now we are two for two. In 2008 former Mayor Scruggs publicly whined about not being invited to the Super Bowl. The NFL offered her 2 tickets at a face value of $700 each. She turned them down saying she couldn’t afford them. Shortly thereafter the Arizona Host Committee gave her 2 free tickets. It is embarrassing that 2 successive Glendale mayors have literally begged, publicly, for Super Bowl tickets. Is there no pride? By the way, 99% of the Valley’s elected officials have not purchased tickets even when available and most are not attending the Super Bowl. The only acknowledged officials going are Governor Ducey, Senator McCain and Representative Ruben Gallego and his wife Kate. All paid for their tickets. Way to go, Mayor, past or present. It seems fitting with the Super Bowl in Glendale only two weeks away and the Packers/Seahawks and Colts/Patriots games on today, January 18, 2015 that the NHL and its nonprofit status merits another look. Many of you may not know that the NFL has nonprofit, 501 (c) 6 status. What other types of organizations enjoy 501 (c) 6 status? Chambers of Commerce and Boards of Trade. Hmmm, which one of these is not like the others? It originally received its tax exempt status in 1945. It’s doubtful if anyone remembers why. In 1966 Congress reaffirmed the NFL’s tax exempt status in return for a merger between the AFL and the NFL; the promise to locate a team in New Orleans and other miscellany. The NFL is a billion dollar industry. This year the media is reporting that it will earn well north of over $10 billion dollars (that’s billion with a ‘b’ and not a typo). To be fair it does pay some taxes through a subsidiary, NFL Ventures, for its TV deals and some merchandise sold. The NCAA, NHL and PGA Tour do have a similar non-profit status. Other sports organizations with the same stature as the NFL do not share in this form of congressional largesse. Major League Baseball gave up its nonprofit status in 2007 and the National Basketball Association has never been tax-exempt. What makes the NFL nonprofit status so obscene to so many people? It revolves around the ever growing and greedy, very detailed and specific stipulations required to be met by state host committees. It’s gotten to the point that nearly everything, down to the towels used by the players, must be comped or deeply discounted. The bid always requires the payment of no taxes by governments – local, county and state. State host committees are forced to solicit more and more dollars from the public/private sectors to offset the costs of promotion and hosting. For example, the City of Scottsdale ponied up a million dollars to the Host Committee. In 2008, the last time Arizona hosted a Super Bowl, the Arizona Host Committee’s budget was approximately $18 million dollars. This year its budget is over $30 million dollars. In November of 2014 legislation was introduced in Congress to remove the NFL’s tax exempt status. Don’t expect it to go anywhere. This time it is spite legislation and an attempt by some Democratic congressional members to provide pay back because of the NFL’s refusal to change the name of the Washington Redskins and its failure to address the issue of domestic violence (ala Ray Rice) in a more appropriate fashion. The legislation was offered under the guise of earning the federal government over $100 million dollars in tax revenue over the next ten years. Congressional efforts to rein in the NFL will, as in other years, die quietly. The NFL spends millions, reportedly over $2 million in the past two years, in support of various congressional candidates. They will not willingly kill their golden goose. Throw in the dollars spent on pure lobbying efforts to kill any such legislation and the NFL’s nonprofit status will remain intact. So, it seems the big gorilla will remain the big gorilla, for now, as the league and team owners enjoy tremendous profits on the backs of you, me and every other taxpayer in the country. Lately media reported the reason Glendale would not be hosting NFL Super Bowl related events was that the Bidwills, the NFL and the Arizona Host Committee felt Glendale was not fulfilling its obligations with regard to the parking provision or capping Glendale’s hotel room rates. Oh really? It was all smoke and mirrors. Let’s revisit the Cardinals/Arizona Host Committee bid. Mike Sunnicks had an article about the bid in the Phoenix Business Journal on October 12, 2011, 2 and 1/2 years ago. Here is the link: http://www.bizjournals.com/phoenix/morning_call/2011/10/arizona-super-bowl-to-have-downtown.html . The story says in part, “Concentrating more Super Bowl-related events in downtown Phoenix was a key component of the winning presentation put together by the Arizona Cardinals, advertising agency E.B. Lane and the Arizona Host Committee.” It went on to say, “For the 2015 game, the Valley’s bid promoted more downtown Phoenix events. That includes the media center and media hotels. Rutherford, New Jersey can feel Glendale’s pain. That’s where this last Super Bowl was hosted but the media ignored Rutherford and planted themselves in New York City, a far sexier site. Nearly every advertisement and every major NFL related event for the Super Bowl was in New York City. Gosh, New York renamed a street as Super Bowl Boulevard. That is exactly the treatment Glendale got the first time around and will experience this time as well. All major advertisements and the media will tout Phoenix, not Glendale. At the time of the latest bid clearly Glendale was already being pushed aside by the Bidwills, the NFL, the Arizona Host Committee and the Arizona Sports and Tourism Authority (AZSTA). That is why when Michael Kennedy (past President of the Host Committee and the Cardinals’ attorney) presented the bid before the Glendale City Council seeking their support he positively sneered at my request that the Host Committee support a bill that would recompense Glendale for its expenses. All of them probably rue the day they decided to build the stadium in Glendale because they sure act that way. It appears to be inconsequential to them if Glendale loses money as the host city. Their view of Glendale is as a minor player and has never been welcome at the “big boys’ table” with any sense of legitimacy. Why the public vituperation by Michael Bidwill now? It sounds good to accuse Glendale of a lack of cooperation hosting the Super Bowl but that’s just more smoke and mirrors. The real reason is likely that the Bidwills want Glendale to build that darned parking garage…now. Is he using the Super Bowl to put pressure on Glendale? That is for you to decide and many of you may come to the conclusion…yes. Mr. Bidwill violated the cardinal rule (no pun intended!) about airing dirty linen in public. In so doing, he may very well have damaged the Valley’s chances to host future major events. On Sunday, October 13, 2013 the Arizona Republic posted an editorial entitled City Finally Getting Clue on Super Bowl. Here is the link: http://www.azcentral.com/opinions/articles/20131007glendale-super-bowl-editorial.html . If I wanted a sermon I can always get one from my priest. At least the editorial acknowledged the NFL’s heavy-handed demands with, “The NFL can be a demanding taskmaster when it comes to operating its big game. It wants to have things just so, and those things can be costly.” And that’s the point. The costs borne by the Host City far outweigh the revenue earned to cover those costs. Not so for Scottsdale, Phoenix, etc., who reap the revenues from major NFL events that earn enough to pay for their expenses. The editorial failed to acknowledge or even mention that other states, Texas and Florida, do pay Host Cities for their losses. The article lays blame on Glendale, its usual modus operandi and its favorite city to bash, by saying, “…Glendale has been slow to grasp these essential details.” Oh really? Glendale successfully hosted a Super Bowl. It knew what to do and when to do it and performed at a very high level. Glendale has proven its ability to host successfully. Glendale understands what is required of it and when but it is up to the Arizona Host Committee and the NFL to acknowledge Glendale as a full, participating partner. They have failed to do so to date. Lastly, it says, “The Valley of the Sun has developed a strong reputation among those in college football and basketball and within the NFL who make the decision about where to host their marquee events.” Then it’s up to the member cities of the Valley of the Sun to create a mechanism that makes their sister city, Glendale, financially whole. Glendale was proud to host a Super Bowl and would be proud to host future ones but not by committing financial hari kari. This site contains copyrighted material the use of which has. In accordance with Title 17 U.S.C. Section 107, the material on this site is distributed without profit to those not always been specifically authorized by the copyright owner. We are making such material available in our efforts to advance understanding of environmental, political, human rights, economic, democracy, scientific, and social justice issues, etc. We believe this constitutes a ‘fair use’ of any such copyrighted material as provided for in section 107 of the US Copyright Law who have expressed a prior interest in receiving the included information for research and educational purposes. For more information go to: http://www.law.cornell.edu/uscode/17/107.shtml. If you wish to use copyrighted material from this site for purposes of your own that go beyond ‘fair use’, you must obtain permission from the copyright owner. Disclaimer: I voted in favor of Glendale’s hosting of the 2008 Super Bowl. I wanted to see if its results benefited Glendale financially. It did not. As a result, I voted against Glendale’s hosting of the 2015 Super Bowl. Please take a moment to participate in my informal Super Bowl poll to the left of this article. The NFL is a non-profit and also a monopoly. It has tremendous wealth and power. It encourages potential host cities to upgrade or construct football facilities with the promise of a Super Bowl. It validates the economic benefits of a Super Bowl by funding economic studies and then uses their results liberally. How did Glendale end up in this mess? Go back to the time when the Bidwills were looking for a permanent home for the Cardinals’ stadium. Remember? None of the East Valley cities, even Mesa, wanted it. The East Valley was where they yearned to locate but it was not to be. So it came as no surprise that John F. Long’s offer of free land in West Phoenix adjacent to the 101 was rejected. Glendale was the bridesmaid who became a bride by default. After all possible options had been explored Glendale was chosen. It was positively embarrassing. The state created the Arizona Sports and Tourism Authority (AZSTA) as a mechanism to fund construction of the stadium and the Bidwills took out a loan (at an extremely favorable interest rate) from the NFL’s G-3 Stadium Program. Glendale issued $35 million dollars worth of bonds to pay for enhancing the infrastructure around the stadium. Make no mistake it may be a County facility outwardly under the control of AZSTA but it is the Bidwills who silently manage and operate the facility. As the specifics of the event unfold it was learned that Scottsdale would continue to have a mutual relationship with the NFL for many years to come regarding hotel rooms and in fact, the teams would stay at Scottsdale hotels. Nearly all of the associated events and parties – even the media center — would be in Phoenix, Scottsdale, Paradise Valley, Tempe — any place but Glendale. We aren’t tony enough. Is it any wonder when you hear when Jacksonville hosted the Super Bowl each of the 32 team owners was given personalized use of a yacht? It remains advantageous to every entity but Glendale to this day. Just look at the Scottsdale Council Economic Development report of April 30, 2013. Here’s the link: http://www.scottsdaleaz.gov/Asset48262.aspx . Check out the proposed agreement summary below between the Arizona Host Committee and Scottsdale. Is it any wonder Glendale may not be thrilled with the prospect of hosting at a loss when it continues to receive the back of the NFL’s and Arizona Host Committee’s hand? The following are benefits outlined in the proposed agreement between the City and the Arizona Super Bowl Host Committee. • Host Committee will include 3,194 hotel and resort rooms within Scottsdale in its official Super Bowl XLIX room block. • Host Committee, working with the SCVB (Scottsdale Convention and Visitors Bureau), will encourage Host Committee sponsors and prominent groups to use Scottsdale hotels and resorts for Super Bowl XLIX. • Host Committee, working with the Sponsor and SCVB, will encourage the use of Scottsdale venues and businesses as sites for Host Committee events and activities related to Super Bowl XLIX. The Host Committee will encourage the use of Scottsdale bars and restaurants as sites for third parties for private events. • Host Committee will include Sponsor and SCVB representatives, to the extent qualified, on committees dealing with regional public safety and transportation issues associated with the Super Bowl. Sponsor and SCVB will also be represented on committees, if any, dealing with Host Committee events in Scottsdale. • Host committee will work with SCVB to highlight key Scottsdale resorts, venues, restaurants, etc. during the Host Committee FAM trip proposed for 2014. • Host Committee will use commercially reasonable efforts to include applicable Scottsdale businesses in Host Committee’s Business Connect Program, benefiting local minority and women-owned businesses. • Sponsor will have representation in the Host Committee Business Development program, focused on attracting new companies to or expansion of existing companies in Arizona and Scottsdale, and increasing Scottsdale’s convention and meeting business. • In accordance with the Agreement and Sponsor Guidelines, Sponsor or SCVB logo or text will be included in Arizona Host Committee promotional materials including website and brochures. • In accordance with the Agreement and Sponsor Guidelines, Host Committee will include Scottsdale events in its social media and provide support for Sponsor events, which might include guest speakers, mascot appearances, etc. • Host Committee will designate a Host Committee liaison that is available to the Sponsor for questions, concerns, resolutions. • Host Committee, at the Sponsor’s request, will provide an annual meeting and/or written communications that provide updates on all that is occurring in the way of progress, planning of the event, as well as sponsorship deliverables beginning December 2013. • Host Committee shall provide the Sponsor a Post Event Report, which will enable an evaluation of the Host Committee’s performance under this Agreement Report shall include a valuation of the Sponsorship Benefits. The report shall be provided to Sponsor no later than 60 days following the conclusion of Super Bowl XLIX. • In addition to the Post Event Report, if requested. Host Committee will work with Sponsor to prepare recap for the Sponsor Council within 60 days following Super Bowl XLIX. ESPN has announced it will use Scottsdale as its base for weeklong Super Bowl coverage and will offer the city tons of free publicity as it highlights Scottsdale’s desert scenes. For another “diss” to Glendale check out this website: http://www.visitphoenix.com/media/details/index.aspx?nid=412 that blatantly announces that the NFL has chosen Phoenix as its 2015 host city. Geez…and all along we thought Glendale was the host city. How silly of us. Every Glendale resident should be outraged. How does the Arizona Host Committee fit into this scenario? It is the interface with the NFL. It prepares and presents a bid for consideration to the team owners. It is charged with raising millions of dollars to offset the costs (and perks offered to team owners and NFL upper management) of the Super Bowl. It is the visible voice of the Super Bowl until the NFL arrives in town. It must gather thousands of volunteers to work the event. Each of the participating cities must tithe to the Host Committee based on population (ironically, Glendale’s population is greater than that of Scottsdale’s). Prior to the first Super Bowl in Glendale the Host Committee virtually ignored Glendale. It had meetings of which Glendale was not informed and to which Glendale was not invited to participate. From then until now it has treated Glendale as the poor relative to be tolerated. It never welcomed Glendale as a full participant in the decisions or preparations. When Glendale’s financial loss from the first Super Bowl it hosted was known I began to call for the Host Committee and major beneficiary cities like Phoenix and Scottsdale to lobby for legislation to make the host cities financially whole. After all, it would have benefited them as well. The silence was deafening. What about the Bidwills? After all, they have a lot of influence in this state. Where was their support? Oh wait, they are holding out for a parking garage built by the city. Collectively there was none and instead we heard that perhaps we should wait a few years until the legislative atmosphere was more amenable. Well, a few years have passed and there’s still no support. The September 29, 2013 edition of the Arizona Republic blares that the NFL will place events in other Valley cities. Oh really? No big deal. They’ve been sticking it to Glendale for years. Excuse me, what are they going to take away when there are no events slated for Glendale to begin with? No, this is really a piece of heavy handed blackmail, big time, by the NFL. They perceive that proverbial crack in the host city dike. They want Glendale’s hotel rooms. Glendale’s hoteliers have declined to participate and why should they? What’s in it for them? Do they get additional publicity because a team is staying at a Glendale hotel? No. Do they get additional publicity because NFL team owners are staying at a Glendale hotel? No. There is no incentive for Glendale hoteliers to cooperate. It earns them nothing other than a cap on what they charge for a room during the event. When will they realize that if they want Glendale’s support and that of its hoteliers rather than using the blackmail stick they might consider the incentive carrot. Our Moms used to say, “You get more flies with honey than vinegar.” It’s time for the Host Committee and the NFL to welcome Glendale into the fold as a full participant in preparation for this event. Think about this. The NFL has set up a system whereby host cities must bid against one another and are forced to offer more and more outrageous goodies for the privilege. It’s time for the host cities to form a consortium of their own to stop this ever more expensive and crazy bidding war. They should develop their own basic ground rules and commonalities of interest. Perhaps they should develop a rotation system. It would certainly be to their advantage. What is the NFL going to do? Move to Europe? Hardly. Did Glendale do a good job hosting its first Super Bowl? You bet it did. The city received many kudos. We were told by NFL officials, “You had the best Super Bowl ever.” Is Glendale capable of hosting the Super Bowl? Of course it is. Transportation and Public Safety personnel already have the experience of one under their belts and have been planning for the next one. Our city personnel are competent and experienced. The city is ready. Is parking an issue? No, it is not. Part of the parking requirements in the bid refer to the NFL Experience which is going to Phoenix, not Glendale. No surprise. The NFL rents vacant land to use as temporary parking lots in addition to the parking provided by Glendale. It’s a non-issue. There is one area of concern. In preparation for 2008 the council made a conscious decision to allocate funds in a special account for several years prior to the event. This time there has been no conscious decision to allocate funds for use during the event. Perhaps it will be done at the October 1, 2013 city council workshop or failing that, certainly at the council budget workshops in the spring. The 2008 Super Bowl cost the city over $2M. Expect that cost to have doubled to at least $4M. Where will it come from? Council must address this issue and do so quickly. Someone asked if the first Super Bowl was so bad for Glendale why is it hosting another one? The answer is not quite so simple. A majority (I was not one) of the council voted to participate in the bid process and therefore were on board to act on a winning bid. I cannot speak for the majority. Their rationale appeared to be to ignore Glendale’s fiscal loss from 2008 and to focus on the intangibles, especially the Frisoni message of intangible publicity value for Glendale. I question that assumption when the media center will be sited in Phoenix and networks like ESPN will broadcast from Scottsdale. I assume they thought the intangibles outweighed the negative fiscal loss to the city. Or perhaps they feel that hosting the Super Bowl gets them an invitation into the “big boys club.” Our former mayor, who voted in favor of hosting the Super Bowl in 2015, often stated that the West Valley, especially Glendale, did not get the respect it deserved from other Phoenix metro cities. Councilmembers Knaack and Martinez were very tight with the former mayor and may have shared her perspective. If I was on Glendale’s city council and another opportunity presented itself to host another Super Bowl, just as for 2015, under the current conditions, I would vote “no.” It’s a matter of principle. Glendale must be recognized by the NFL and the Arizona Host Committee as a full partner in the process. It must reap some of the rewards as a host city by becoming a site for major special events and parties. Until there is a financial mechanism in place to make Glendale whole it makes absolutely no sense for our residents to subsidize an event that seems to benefit everyone but Glendale.